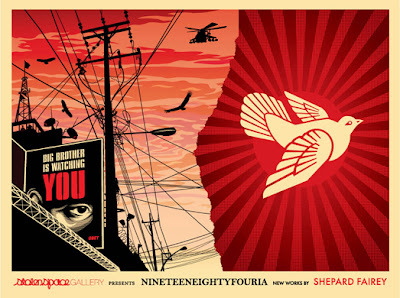 In more than a passing reference to the surveillance culture of Orwell's 1984, Shepard Fairey brings his new exhibition 'NineteenEightyFouria' to London's Stolenspace. Comprised of a range of artworks, from large scale multi media installations to smaller album screen prints Shepard's artwork both scrutinises and distorts the narrative of the modern American Dream. Commenting on underpinnings of what Shepard terms the 'capitalist machine' it aims to critique those who support blind nationalism and war. Fairey addresses monolithic institutional authority, the role of counter culture, and independent individuals who question the cultural paradigm. didn't you think the prints were expensive?